Members of the original JUSTICE LEAGUE INTERNATIONAL team must stop their former friend from destroying all of the world’s super-heroes in this graphic novel series that directly ties into BRIGHTEST DAY, the follow-up to the comics event of 2009, BLACKEST NIGHT. 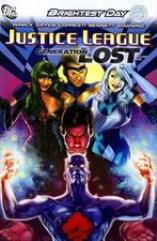 Mind-controlling mastermind Maxwell Lord is targeting the old members of the defunct Justice League International. Now, surviving members Booster Gold, Captain Atom, Fire and Ice must stop him from destroying the entire super hero community.